WESTWOOD, Mass. – While there are plenty of different coaching philosophies in the game of basketball, you can essentially split coaches into two groups: those who foul up by three late in the game, and those who don’t. You can count Sharon’s Andrew Ferguson among the former group. Right after Sharon senior Aaron Strong (career-high 19 points) sank two free throws to make it 61-58 with 5.2 seconds left, the Eagles fouled, sending Walpole to the line to shoot two with 3.3 to go. The strategy worked out, as the first free throw was off, forcing the Rebels to purposely miss the second. 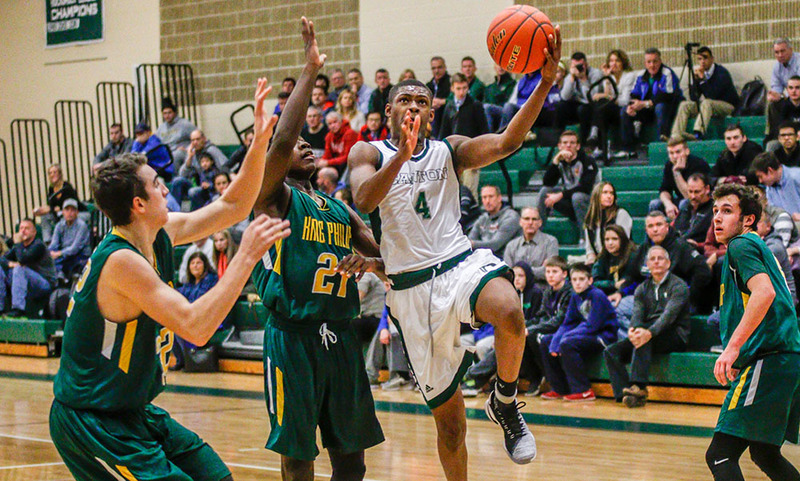 A loose ball ended up with a jump ball with 0.3 left, and Walpole’s last-second desperation three was off the side of the backboard, giving the Eagles their first win of the season. 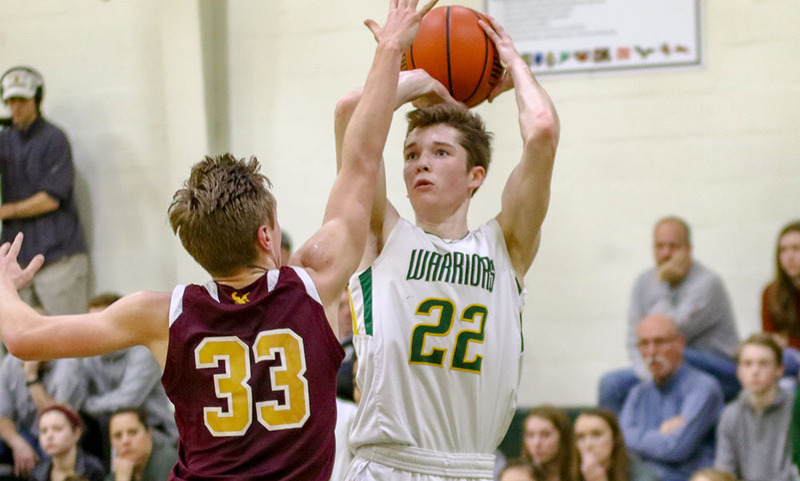 Ferguson’s concern about Falvey was beyond warranted as the senior guard scored a game-high 29 points, keeping the Rebels within striking distance until their fourth-quarter push that nearly stole the game. Sharon had a 12-point lead at halftime and entered the final quarter with a 51-42 advantage and control of the game. 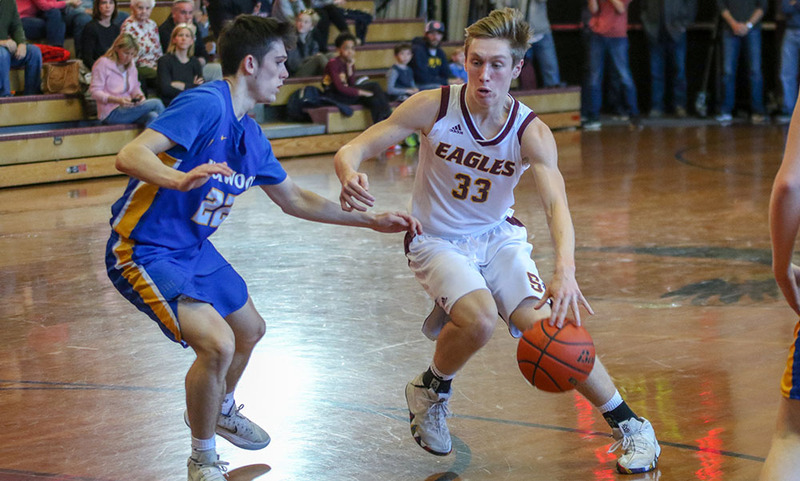 The Eagles had an answer for Walpole’s early push as Caleb Gayle (eight points, seven rebounds) had back-to-back baskets and Stamm drove to the hoop to put Sharon ahead 57-46 with just under six minutes to go. Walpole refused to go quietly, hitting a three after Sharon missed a pair of free throws. The Rebels got a turnover on the ensuing inbounds and converted a three-point play to make it 57-52. After an empty trip, Falvey scored his lone two points on the final quarter with a nice take to the basket. Sharon had a chance to answer but missed two more free throws. After trading misses over the next two minutes, Walpole made it a one-point game on two free throws from Brian DiPasca (18 points). Sharon once again failed at the free throw line but forced a turnover on the defensive end to keep the lead. Despite a missed three, Sharon got the offensive rebound and Strong hit one of two chances at the line to push the lead to 58-56 with 1:32 to play. With 30 seconds to play, Walpole came out of a timeout with a play to try and get level. It looked like the play was going to work when Connor McDonough got free on a curl but Ben Kaplan made a terrific block from behind off the backboard and Strong grabbed the rebound. Strong hit one of two from the line to push the lead to 59-58, but Walpole sophomore Jack Connell drove to the basket for two, cutting the lead to one again. Sharon was almost called for a 10-second violation in the backcourt but Ferguson called a timeout. Out of the timeout, Strong got the ball, was fouled, and hit two free throws to seal the win. “I told Aaron that I trusted him, that I trusted he would make the free throws,” Ferguson said. Sharon trailed twice in the early minutes of the game but went ahead 14-10 by the end of the first quarter and never relinquished the advantage. The Eagles had their best stretch of the first half at the very end of the second quarter. Holding a 22-18 advantage, Sharon closed the first half with an 11-3 run. Aidan Kane (18 points) drove to the rim for two, Gayle hit a mid-range jumper and Kaplan took it strong to the basket for a 29-19 lead. Strong had one of his six steals and converted an easy two and Kane drilled a three on a feed from Stamm just before the buzzer to make it 33-21. 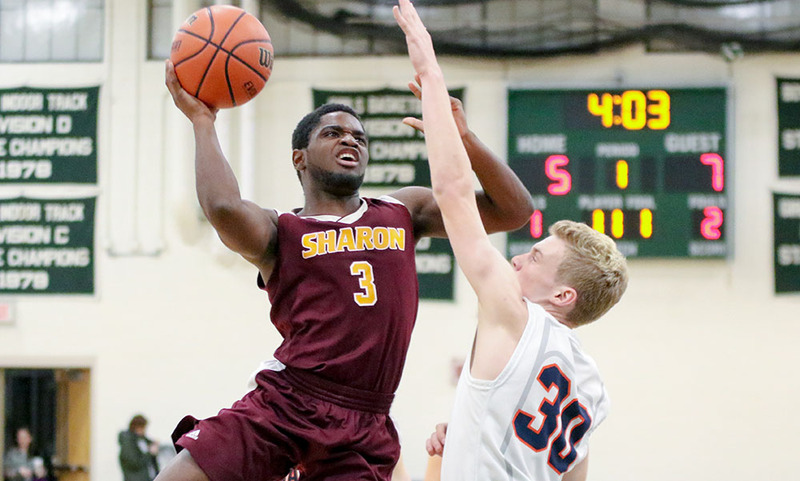 Sharon’s lead expanded to as much as 15 when Strong converted a layup with five minutes to go in the third quarter, but Walpole rallied to get within seven with under two minutes left in the period. JuniorAlec Filipkowski drilled a three to push the lead back to double digits. Sharon boys basketball (1-4) returns home for a Hockomock League game against Davenport division rival North Attleboro on Friday, January 4th at 6:30. SHARON, Mass. – The Sharon defense had held firm for more than 40 minutes without allowing a point, shutting down Cardinal Spellman twice inside the red zone, but as the fourth quarter wound down the Eagles were feeling the impact of the heat and humidity. 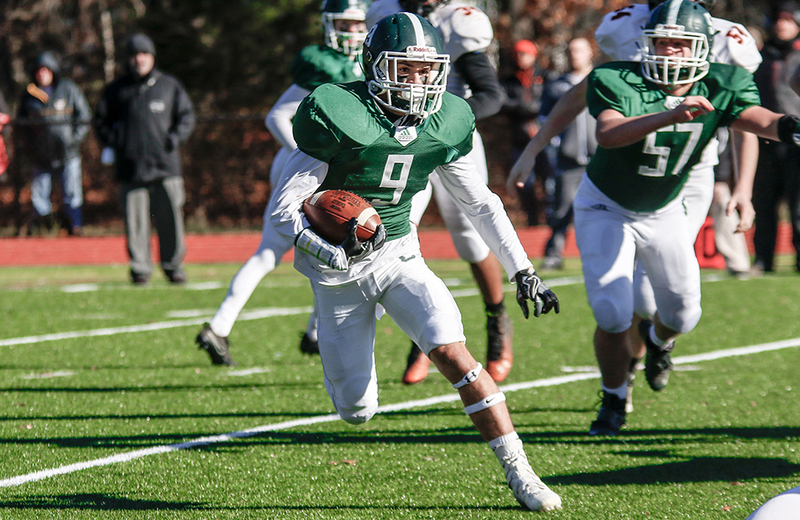 Spellman spread the ball around on offense, using four different running backs behind a sizable offensive line, and it started to pay dividends. The Cardinals were not trying to be tricky, just pounding the ball straight ahead and suddenly they were in the end zone with three minutes remaining. 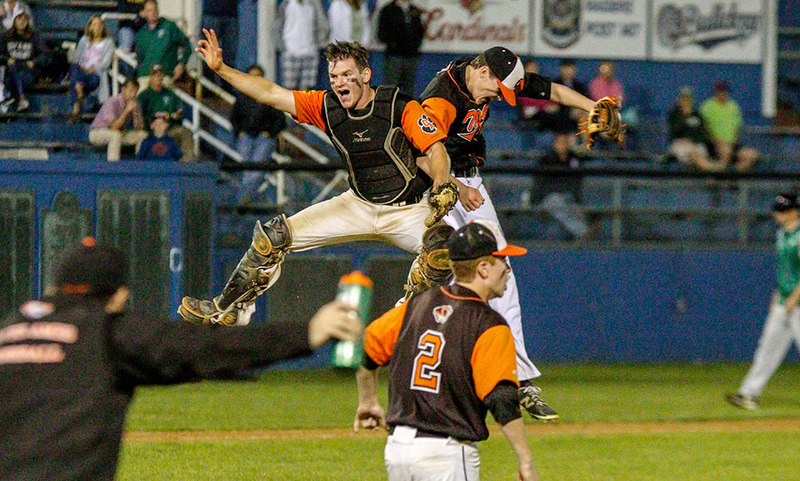 Only a minute later, they had the ball back again deep in Sharon territory and took advantage. 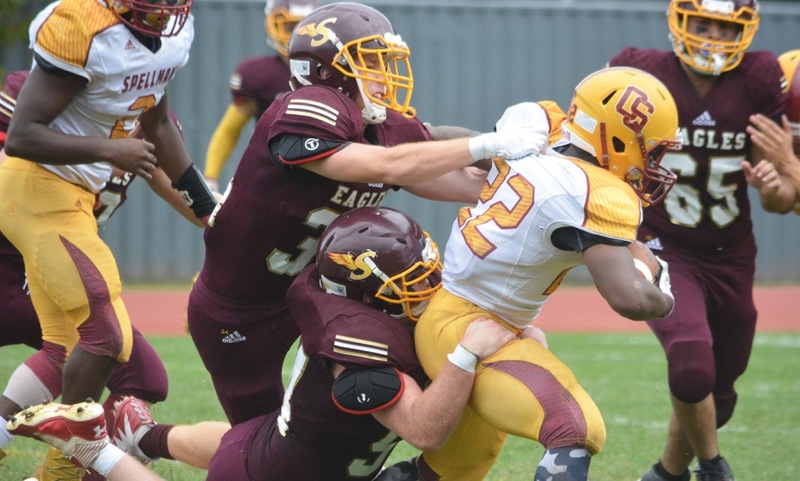 After 40 minutes without an offensive point, Spellman scored a pair of touchdowns in the final 3:21 of the game and stunned Sharon by pulling out a 21-14 victory on Saturday afternoon, denying the Eagles a perfect record heading into the start of Davenport division play next weekend. It was the home team that struck first. Sharon faced third and 10 from its own 10 and junior Jeremy Ruskin (7-21, 240 yards) looked down the far sideline for sophomore Alec Filipkowski, who went up and pulled the pass away from the Spellman defensive back. He raced 67 yards before being pushed out at the Cardinals’ 23. On the next play, Ruskin got his pass over the top of an outstretched defender and into Austin Dodes, who made a diving grab just across the goal line with fewer than 30 seconds remaining in the first quarter. Spellman drove deep into Sharon territory on its next possession, getting as far as the Eagles’s 10, but Dodes broke up a pass play that would have set up first and goal and then Drew Naisuler (who also blocked a punt and was a constant menace on the edge) and Ahmed Sean stuffed the running back for a three-yard loss. On fourth down, Sean stopped a keeper for a short gain. The momentum from the defensive stand only lasted six plays before the Cardinals tied the game. Ruskin’s second down pass was a little behind Naisuler, who got a hand to it but could not haul it in. The deflection fell to Spellman’s Jack Kingston and he returned the interception 40 yards for a touchdown. The score stayed tied into the third quarter. Sharon’s first possession started at its own six-yard-line and Aaron Strong lost a yard on first down. Facing third and 11 from the five, Morse called for a middle screen and the Eagles executed it to perfection. Ruskin hit Chris Gong in a ton of space and the junior running back took off up the field, getting a couple of key blocks along the way, and scoring a 95-yard touchdown that shocked the Cardinals. Spellman put together a long drive early in the fourth quarter, once again reaching the Sharon red zone. Jaden Williams-Thomas and Jake Romanow stopped a run at the 18, setting up third and four. Naisuler stuffed a keeper for no gain and on fourth down, the Eagles stopped a pass play just short of the marker. Unfortunately, the offense could only run a couple minutes off the clock before giving the ball right back. The defense looked winded as Spellman broke off runs of 15 and 11 yards straight up the gut and Jovan Marrero bounced a run off-tackle to the right and beat the Sharon defenders to the goal line to tie it 14-14. Sharon went three-and-out on its next possession and the punt went only two yards, setting up the Cardinals at the Eagles’ 26. Marrero was again the primary back and five plays later he pushed the ball across from the one with just 38 seconds remaining. Ruskin completed passes to Dodes and Filipkowski but then a spike and two incompletions ended the game. Sharon (1-1) will open league play next week by hosting defending league champion North Attleboro on Saturday afternoon.